Given the amount of crime fiction that I read, it’s rare that I’m surprised by a book. 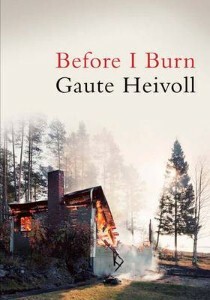 However, Before I Burn by Gaute Heivoll was an unsettling and moving read that defies classification as a traditional crime novel. The book is written in the style of a memoir about a seminal time in the narrator’s childhood when a pyromaniac was destroying houses in his home village in Norway. The incidents took place in the summer of 1978, around the time of the narrator’s birth, so he isn’t relying on his memory to relate the events. Instead, the fires remain ingrained in the population’s consciousness and the story of the local pyromaniac is discussed and reflected up for years after the event. Much of the early book imagines the reactions of residents as they watch their homes go up in flames. Villages who have little in the way of material wealth, lose virtually everything and have to start again from scratch. These scenes are extremely moving, especially as elderly residents watch their life’s possessions go up in flames. The identity of the fire obsessive is known to the reader fairly early on, which adds to the tension as residents speculate who might be responsible. Interspersed in the narrative, and the focus of the later sections of the book, are the reflections of the narrator as he grows up and moves away from his rural upbringing. As a student in Oslo, he buys some trendy spectacles and a large coat and imagines he can create a new personality for himself. But when his father is diagnosed with cancer, he is drawn back to the region of his birth. It’s difficult to judge whether I’ve given too much or too little information about the book in writing this review. It’s beautifully written and the translation, by Don Bartlett, is also excellent. The rural setting is vividly brought to life and adds to the drama of the dual narratives. The narrator is presumably the author, but it’s difficult to tell where memoir and imagination intersect. To call this book a crime novel would be incorrect and also fail to do the work justice. It’s a story, I suppose, ultimately about loss and the nature of madness. Thanks to Atlantic Books for sending me a copy of the novel. Gosh, it sounds brilliant but too sad! You’d have to be in the right mood for that one I think…. and, btw, that cover is very beautiful…. Yes I think mood is all important with this one Moira. I hadn’t really noticed the cover but yes it is beautiful. I’m worried that there’s no mention of a glum, alcoholic, divorced, workaholic policeman in a jumper in your review, Sarah? Surely that’s how we define Northern European crime fiction nowadays?! 😉 (Only kidding – this does sound like a good read). Thanks Vicki. Yes this one does veer from the norm…. Fair enough! Look forward to the review Bernadette. Sarah – I am always glad when a novel does something different and explores crime in a different way. This one really seems to do that. It really sounds like a memorable read. It is Margot.And very sad. This sounds a thought-provoking and interesting read. Straight on the wish list- thanks for the review Sarah. This sounds very interesting and different. I like this kind of narration and storytelling, usually. I will add it to my wishlist. This sounds very sensitively done, almost like an account of real life events. The cover is terrifying – arson is one thing that particularly scares me, I can’t begin to imagine having your home and all your possessions lost to it. This sounds like a book I’d enjoy. I know what you mean Marie. I don’t like the idea of fire either and I hate reading about people who have been burned. I think you might like it Stu. I’ve not heard of this one before, but it certainly sounds interesting, especially as it’s of a subject that’s close to the author in a way.